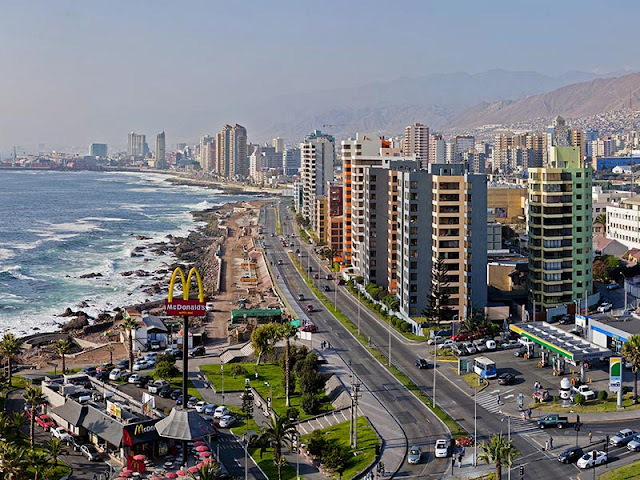 Antofagasta is a seaport of 361,000 inhabitants (the fifth most populous city in Chile according to the 2017 Census), capital of the homonymous region also known as "Second Region of Chile". The distance by land from Santiago is of 1368 Km. Because of the great mineral wealth that covers the entire area and for being one of the most important cities of the country, Antofagasta is called "La Perla del Norte" (The Pearl of the North). It should be noted that the nascent city was part of Bolivia, and after the 1904 Treaty of Peace and Friendship, Antofagasta became part of Chile. Its landscape is dominated by the Pacific Ocean and the immensity of the Atacama Desert, the driest in the World. Today, the economy is mainly based on the exploitation of various minerals, especially copper and a promising future for its large deposits of Lithium, one of the biggest in the World. It is important to point out that Antofagasta is the city with the highest per capita income in Chile, surpassing the US$ 25,000 (2017). 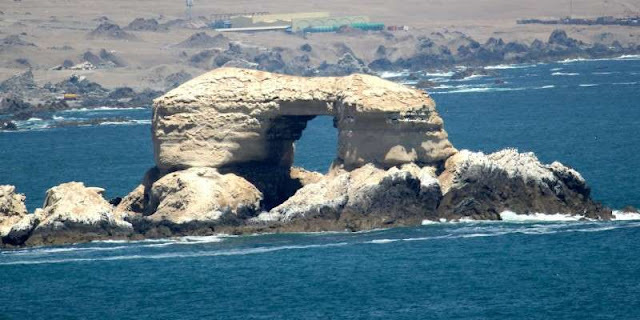 La Portada (English: "The Gateway"), is the best known postcard of Antofagasta and one of the most popular in Chile. It is located 18 Km. North of the city through Route 1 and then a 2 Km. fork corresponding to Route B 446. It is a natural rock formation in the shape of an arch, as a result of the erosive action of the sea on the coast, surrounded by cliffs of 70 meters high. The arch is 43 m high, 23 m wide and 70 m long, very close to the seashore. The base made of volcanic rock is around 150 million years old and the arch formed by sedimentary rock has 2 million years old. The place is also ideal to observe a wide variety of Birds and Marine Fauna, but due to the aridity of the whole area the Flora is practically nonexistent. On the coast there is a viewpoint to safely observe this Natural Monument as well as a Hiking Trail, a Museum and a Restaurant. The access road is available all year round. Plaza Colon is one of the most representative places of Antofagasta. It is the main square of the city, a site full of history because it witnessed the landing of the Chilean troops in 1879 and keeps symbols of the foreign colonies that founded the region. One of them is The Clock Tower donated by the British Colony, installed in 1911 in the center of the square, in commemoration of the first centenary of the Independence of Chile. The monument was originally planned as a scale model of the Tower of the Houses of Parliament in Westminter, but the rules that regulated the constructions of that time prevented the total achievement of the primitive project (it was expressly forbidden that there was any construction that would exceed the Cathedral in height). Its chimes evoke the original Big Ben. Another of the symbols is the Kiosko de Retretas, also inaugurated in 1911, donated by the Croatian Colony in return for the friendship and affection of the former residents. There, every weekend, performed folk groups or military bands. At present, after having suffered serious damage by a strong earthquake in 2007, the Kiosko de Retretas is fully restored. The Statue to Spain and America, donated by the resident Spanish Community, represented by two female images at the top of the sculpture. This set is completed with a Condor holding the Chilean Coat of Arms and a Lion with the Spanish emblem. Visiting for the first time the imposing stone construction of Ruins of Huanchaca, really impresses because of its appearance of abandoned Fortress of some extinct people. But in reality this National Historic Monument, the oldest construction in the city dating from 1888, is what remains of an old silver foundry, belonging to a former Bolivian mining company. The foundry definitively closed its doors in 1902, since then, more than 60 years elapsed until the facilities were transferred by the Government of Chile to the Universidad Catolica del Norte. In 1974 Huanchaca was declared a National Historic Monument. In 2007, with the creation of the Fundacion Ruinas de Huanchaca, integrated by the Universidad Catolica del Norte in partnership with Enjoy Antofagasta, the monument was officially included in a plan that considered its openness to people. Today, the ruins are located within the Parque Cultural Huanchaca, located at 01606 Angamos Avenue, in front of the Enjoy Antofagasta Casino, a Park which also includes the Museo Desierto de Atacama, a great cultural and tourist center of the Antofagasta Region. The non-profit institution Museum of Antofagasta, is a historical, archaeological and geological gallery located at 2786, Jose Manuel Balmaceda Av., Historical Quarter of the city. Created in 1964 under the aegis of the former Universidad del Norte, today, the Museum has 12 permanent rooms and an auditorium for traveling exhibitions, distributed in two buildings that formerly belonged to the Customs Offices and the Maritime Authority. The collection, grouped in the areas of Bioanthropology, Natural and Social Sciences, has around ten thousand cultural assets, including mineral, paleontological and archaeological samples related to pre-Hispanic cultures of the desert's coast. The Museum also includes an important photographic compilation, of around 1,500 images representing different aspects of Antofagasta's society in the middle of the 20th century. In addition, there are ethnographic components, works of art, objects and historical documents related to the urban and mining history of the Antofagasta Region, especially furniture, and an endless number of implements belonging to the daily life and tasks of the once flourishing Nitrate fields. The Balneario Municipal is a very popular artificial beach of Antofagasta, located in the southern part of the city, suitable for swimming and all the activities related to the marine environment. It is surrounded by green areas, restaurants and places of entertainment. The city itself has a rocky coastline, reason why this is one of the few beaches within its limits. 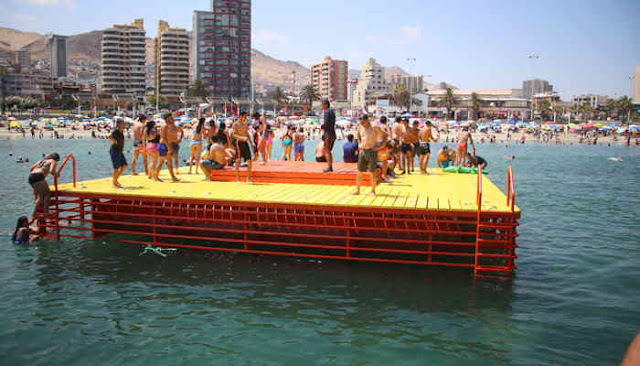 Anyway other beaches suitable for swimming within the city are El Trocadero, Paraiso, soon La Chimba artificial beach and outside the city limits is located Balneario Juan Lopez. Although located 90 km. North of Antofagasta, Hornitos is always mentioned as one of its important attractions for being one of the most beautiful beaches in northern Chile, a coastline of 5 Km. nestled at the feet of the coastal cliffs, typical of the region. It should be noted that Chile's beaches are not very warm because the temperatures are regulated by the Humboldt Cold Current, despite this, the name Hornitos ("Little Ovens") is due to the high temperatures that this part of northern Chile registers during the hottest months (25 to 28 degrees C). Contrary to his reputation of tourist town, until now (2018) Hornitos does not have basic services such as electric power and drinking water, services that the own residents self-provide by means of generators and water tanks, however there is an infrastructure to meet the requirements of visitors such as accommodation, food, recreation. 75 Km. South of the city, in the middle of the Atacama Desert and next to Route 5 (Pan-American Highway) is located this notable work of the Chilean sculptor Mario Irarrazabal. 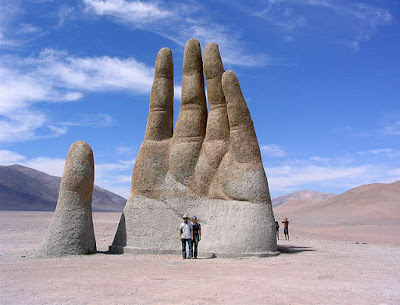 Today, the eleven-meter-high sculpture built with reinforced concrete, has become one of the tourist icons of the so-called "Second Region of Chile". Many are the interpretations that the travellers give to the monument and in fact, according to its author, it leaves it to the imagination of each visitor to the Hand of the Desert. A negative point is the constant cleaning and maintenance required by the sculpture as it is often scratched with graffiti. Undoubtedly, the North of Chile, constituted by the so-called "Norte Grande" (Big North) and the "Norte Chico" (Small North), are worldwide recognized as the best place to observe the firmament, for the clearness and purity of the sky. For this reason, several scientific organizations of global importance have chosen Chile to build their astronomical observatories. According to information provided by the digital newspaper www2.latercera.com, 40% of the facilities for astronomical observation in the World is concentrated in Chile, estimated to increase to 70% within the next 10 years. The same newspaper www2.latercera.com adds that Astronomical Tourism is an activity that is growing, attracting more and more people, both Chileans and foreigners, and during the tours that last approximately three hours, tourists can observe stars , planets, constellations, galaxies, nebulae, the sun and the moon, through modern and powerful latest technology telescopes. The largest number of observatories nationwide is located in the fourth Coquimbo Region, however Antofagasta stands out for the importance of its facilities such as Cerro Paranal or VLT (Very Large Telescope), 130 km south of the city, considered the largest installation of its kind worldwide, operated by the European Southern Observatory. Paranal has the most advanced facilities for astronomy, being the most productive observatory all over the World, based on its investigations, more than one scientific document per day is issued. Other very important observatories are ALMA (Atacama Large Millimiter Array), the largest Radio Telescope in the World, consisting of a group of 66 antennas or radio telescopes seven and twelve meters in diameter. On the top of Cerro Armazones (Armazones Mountain) will be located the ELT (Extremely Large Telescope), still under construction, which should become the largest optical observation center ever built. Several of the large scientific observatories accept visits by means of online booking systems but these must be done months in advance. However, in the local Tourism Agencies, you can hire tours to smaller observatories, but no less interesting such as Paniri Caur Chiu- Chiu, 35 Km. from the city of Calama; Ahlarkapin Astronomical Observatory, staffed by natives of the archaeological town of San Pedro de Atacama; the tour to Licanantay Ethno-Astronomical Observatory, also in San Pedro de Atacama; the Qatachilla Astronomical Tour in the Atacama Desert, 80 km South of the city, etc., etc.